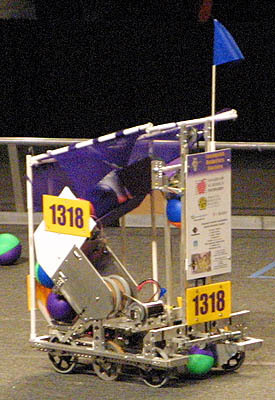 Aim High is the 2006 FIRST Robotics Competition game. The game is played on a field with three goal openings in each alliance wall. The objective of the game is to shoot, push, or roll balls into the goals. The match starts with an autonomous period where robots try to score goals using only pre-programmed instructions. The alliance who scores the most goals receives 10 bonus points. At the end of the match, robots climb onto the platform in front of the alliance station to receive bonus points.